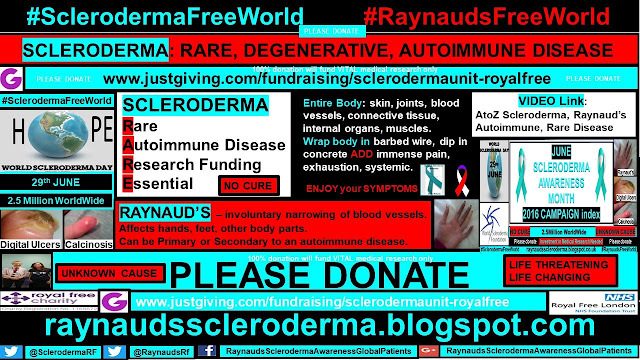 Raynauds Scleroderma Global Patients: Scleroderma Awareness Month 2016, Raynaud's, Autoimmune Rare Disease. 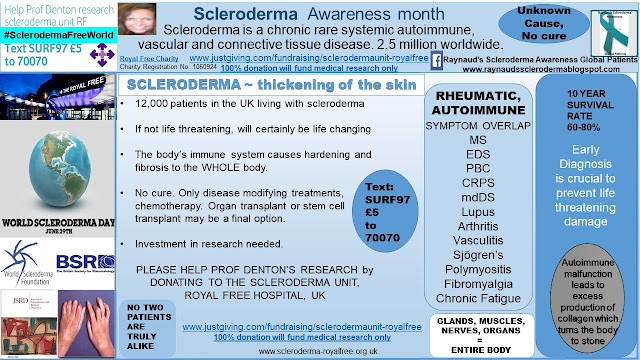 Scleroderma Awareness Month 2016, Raynaud's, Autoimmune Rare Disease. Over the course of the awareness month of June, I will be posting daily information about the autoimmune Rare Disease, Scleroderma, and Raynaud's phenomenon. I very much hope to provide an 'A to Z', - 'all there is to know' about this 'nightmare' health challenge. Please DONATE where 100% of your monies will be used for research purposes only.